In the long-term interest of avoiding another global war, the U.S. for the first time used economic assistance as a strategic element of its foreign policy, offering significant aid to Europe. By June 1947, when the UN Relief and Rehabilitation Administration stopped shipments of food to Austria, the U.S. had spent $300 million in food aid to avert a hunger crisis. On April 3, 1948, President Harry S. Truman signed the Economic Cooperation Act, authorizing establishment of the European Recovery Program (ERP), later known as the “Marshall Plan.” The Austrian government accepted the offer to join, and on July 2, 1948, a bilateral agreement was signed. The U.S. government funded the delivery of food, machinery, and raw materials to Austria. 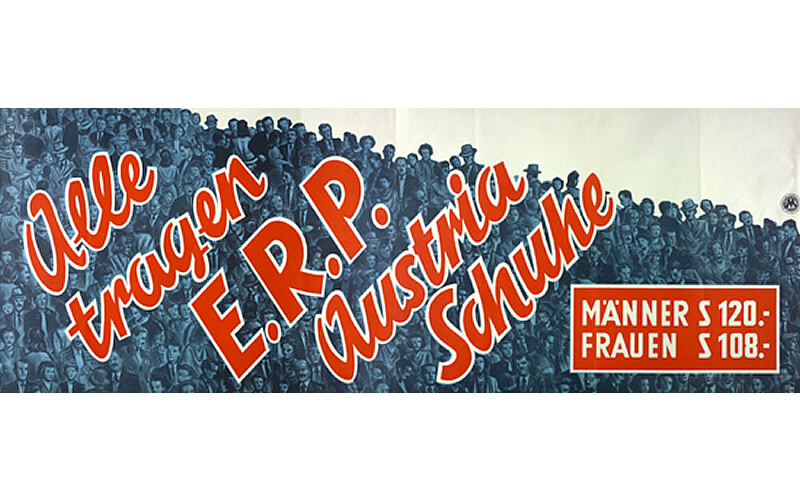 Marshall Plan aid to Austria from July 1948 to December 1953 totaled $962 million, making Austria the highest per capita recipient of ERP aid after Norway. In tandem with the ERP, Amerika Häuser, representing a “Marshall Plan of the Mind,” were established across Austria, serving as libraries, concert halls, and movie theaters to build and strengthen cultural ties and shared values between Austrians and Americans. One of 22 new diesel tractors paid for by the Marshall Plan and assembled by Eibl & Wondrak, Austrian agents for the U.S. company International Harvester, Vienna, May 1949. Willi Steiner, clad in the traditional Loden suit, made of fabric from his firm Loden Steiner, checks a shipment of wool imported from Italy through the Marshall Plan, 1949. In 1951 the Marshall Plan enabled the United Iron and Steel Plant (VOEST) in Linz to import this giant MESTA steelrolling mill from Pennsylvania. 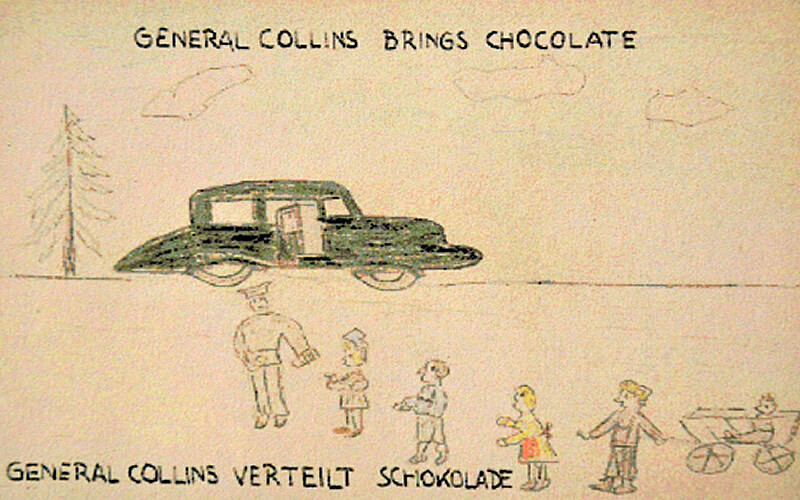 Drawing depicting the U.S. Army delivering chocolate to children in Austria. U.S. funding revitalized local industry and labor markets, helping, for example, women workers in a Viennese textile factory, 1946. On March 29, 1961, Austrian Federal Chancellor Julius Raab and U.S. Ambassador H. Freeman Matthews signed the “ERP Counterpart Settlement Agreement,” which turned control of the ERP Fund over to the Austrian government. With assets of about $3.5 billion and annual loans of $356 million, the ERP Fund is operational to this day and remains one of the most important and dynamic instruments of Austrian structural and economic policies. 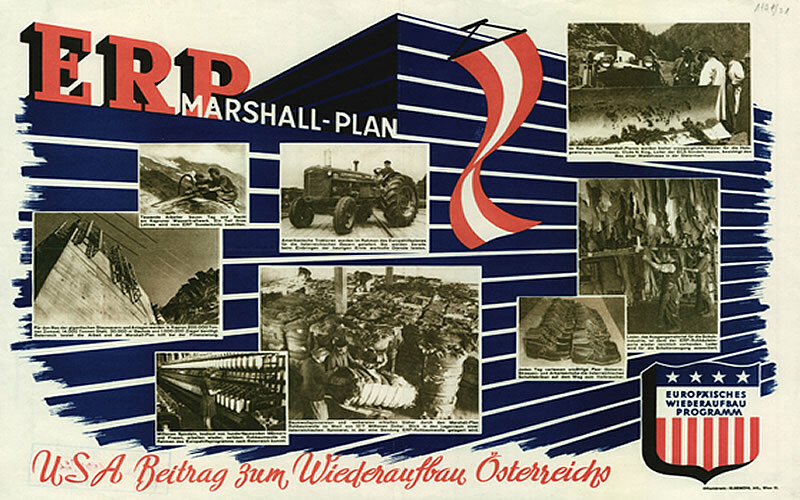 In June 2007, in commemoration of the 60th anniversary of George Marshall’s historic speech, the Marshall Plan Foundation was established with the goal of supporting educational exchange for Americans and Austrians. As part of post-WWII reconstruction, the Fulbright Act (1946) provided economic assistance for education and research and laid the foundations for the United States’ renowned academic exchange program. In 1950 Austria was among the initial handful of countries to establish a bi-national Fulbright Commission. This flagship U.S. academic exchange program was conceptualized by Senator J. William Fulbright to: “increase mutual understanding between the people of the United States and the people of other countries…and thus to assist in the development of friendly, sympathetic and peaceful relations.” Since 1951, more than 2,300 American and 3,500 Austrian grantees have participated in the Fulbright Program. Since 1963, it has been co-funded by Austria. The Fulbright Commission has placed more than 2,800 U.S. university graduates at secondary schools in communities all over Austria under the auspices of the Austrian Ministry of Education’s Foreign Language Teaching Assistant Program. 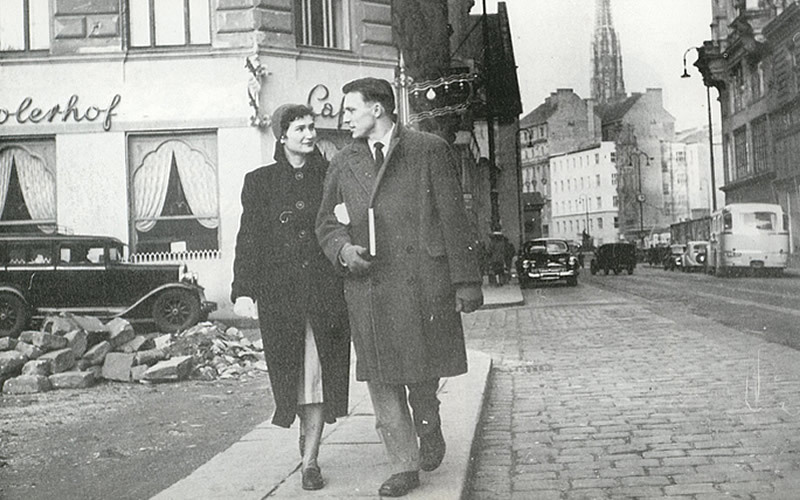 In 1950 Alberta and Clarence Giese were among the first U.S. students to study in Austria after World War II. They founded the Institute of European Studies in Vienna, the forerunner of IES Abroad, a highly esteemed student exchange program. 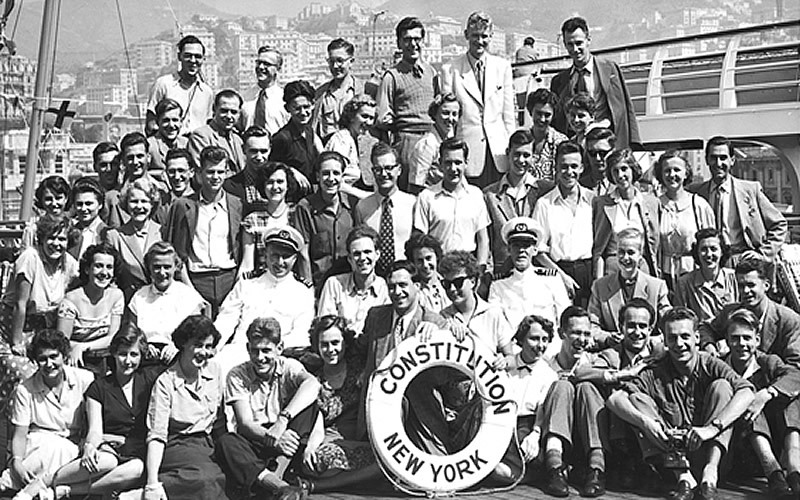 The initial group of Austrian Fulbright grantees on board the SS Constitution, headed to the United States in 1951. Elisabeth Dietrich-Schulz, Director of the Austrian Parliamentary Library in Vienna, participated in the International Visitor Leadership Program (IVLP) “American Libraries,” June 2009. Josef Krainer, future Governor of Styria, shortly before his departure as an exchange student to the University of Georgia. U.S. Secretary of State Dean Acheson, Senator J. William Fulbright, and Austrian Ambassador Ludwig Kleinwächter (from left to right) at the signing of the first agreement to establish Fulbright exchanges between the Republic of Austria and the United States of America on June 6, 1950, in Washington, D.C. The 60th anniversary of the Fulbright Program in Austria, June 7, 2010: Karlheinz Schwarz, President of the Austrian Fulbright Alumni (Ieft) and U.S. Ambassador William C. Eacho (center) with alumni from the inaugural class of 1951-52. Austrian grantees: Hubert Feichtlbauer (St. Louis University), Thomas Chorherr (Ohio Wesleyan), Eva Schussek (University of Arkansas), Friedrich Gleissner (Harvard), and Lonnie Johnson, Executive Director of the Fulbright Commission. 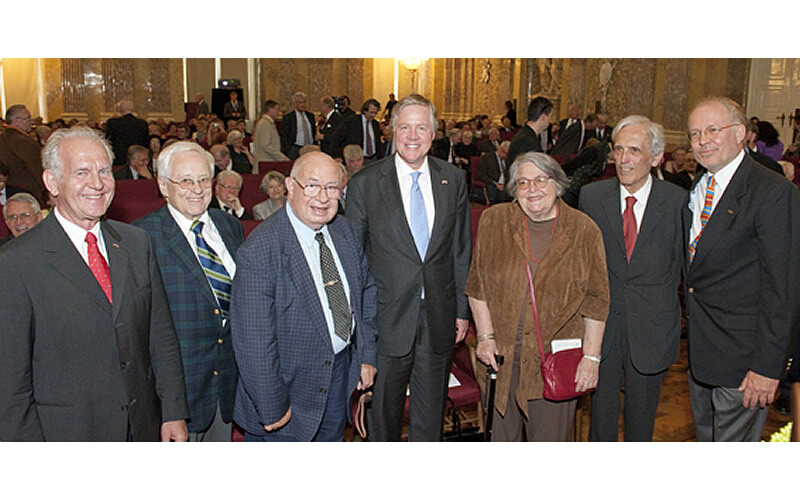 Austrian-American exchanges have grown steadily since World War II. IES Abroad, the largest facilitator of study abroad programs for U.S. students, was founded at the Institute of European Studies in Vienna in 1950. Every year, about 1,000 Austrians study at universities in the U.S., and some 2,700 Americans study in Austria through programs developed by Austrian and American educational institutions. 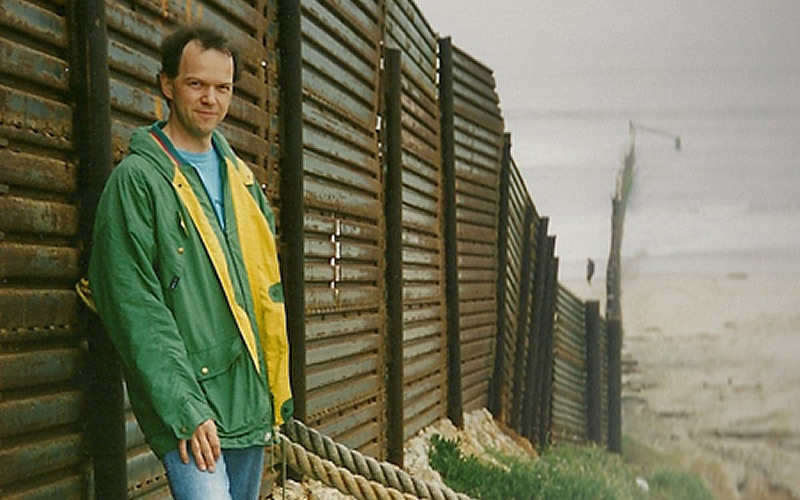 Over the past 60 years, more than 1,000 Austrians have been invited to participate in the International Visitor Leadership Program (IVLP), the U.S. Department of State’s premier professional exchange program. Through short-term visits to the United States, current and emerging leaders from a variety of specialized fields experience American culture and society firsthand and can cultivate lasting relationships with their American counterparts.